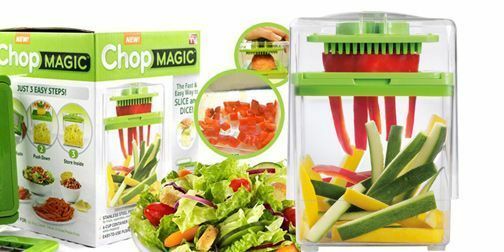 Chop Magic makes food prep lightning fast and easy. With this handy kitchen tool, you can chop a whole onion in just one second with no messy cleanup or tears. 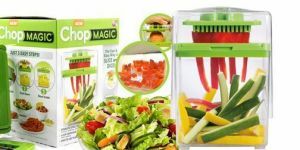 It chops, dices, cubes, minces, slices and more. It features 12 precision blades that make even large tasks faster and more uniform every time. Stainless-steel cutting edges retain their sharpness and resist staining. They""re also highly durable. Ultra-sharp blades reduce the amount of force you have to use, helping you save your time and energy. The catch container keeps your counter tops clean and doubles as a 6-cup measuring container. Pick up a Chop Magic in stores or online.